Chlorosis is a yellowing of leaves resulting from a reduction in the amount of chlorophyll, the green pigment necessary for photosynthesis. The yellow color may cover the entire leaf, or be restricted to certain areas with parts of the leaf still green. When only the spaces between the leaf veins become pale but the veins themselves remain a normal green, this is referred to as an interveinal chlorosis. Chlorosis is usually a symptom that something is wrong; however, a few of the oldest leaves becoming yellow may merely be a normal aging process. Both the pattern of the yellowing on the individual leaves, and the distribution of affected leaves on the plant, e.g. the whole plant, youngest leaves, oldest leaves are often used to aid in diagnosis. Some possible causes are incorrect soil pH, nutrient imbalance, unsuitable soil moisture levels, root problems, overfertilization, disease, insects, and herbicide injury. 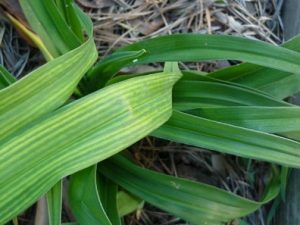 The image below illustrates a chlorotic daylily growing adjacent to a normal green one. In this particular instance the yellowing is interveinal as opposed to covering the entire leaf.